I have hundreds of ideas swimming through my mind at any given time, but the ones I'd like more time to explore and play around with are ideas for re-purposing vintage linens. We had a lovely relaxed weekend. On Saturday morning we checked out a few garage sales and found a brilliant rowing machine for minimal cost, I experimented in the kitchen and successfully came up with a lovely slice recipe which I'll share another day, Mr E pottered around with the car and wrote some school assessments, we watched a wonderful new movie (Lion), and eventually closed our weekend with fish and chips by the beach at sunset. 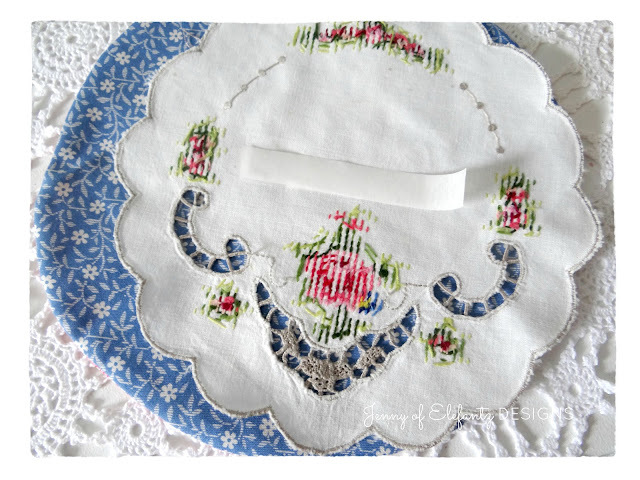 In between these activities I indulged myself by following through with a vintage doily idea that's been simmering away in my mind for weeks, so felt totally content when it was complete. Some cutting here, some stitching there, I didn't rush anything but weaved the project throughout our two day break until all that was needed were a button and ribbon sewn in place early Monday morning. I'll share with you the steps I took, but there's no measurements or patterns sheets because it grew from one circular cross-stitched doily I've had for many years. 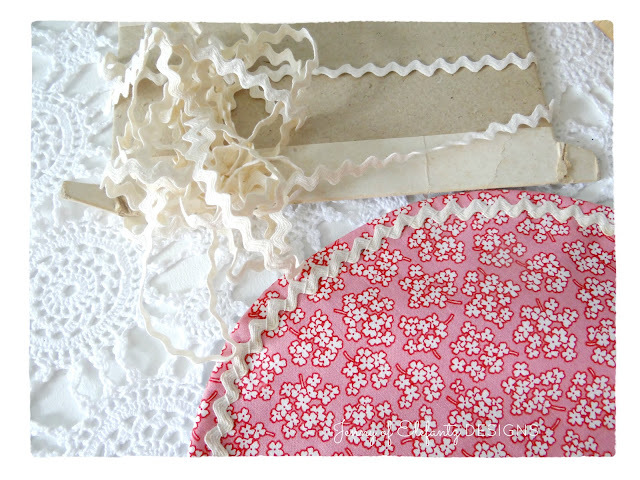 Your doily may be a different shape or size, but the basic instructions will work none-the-less. 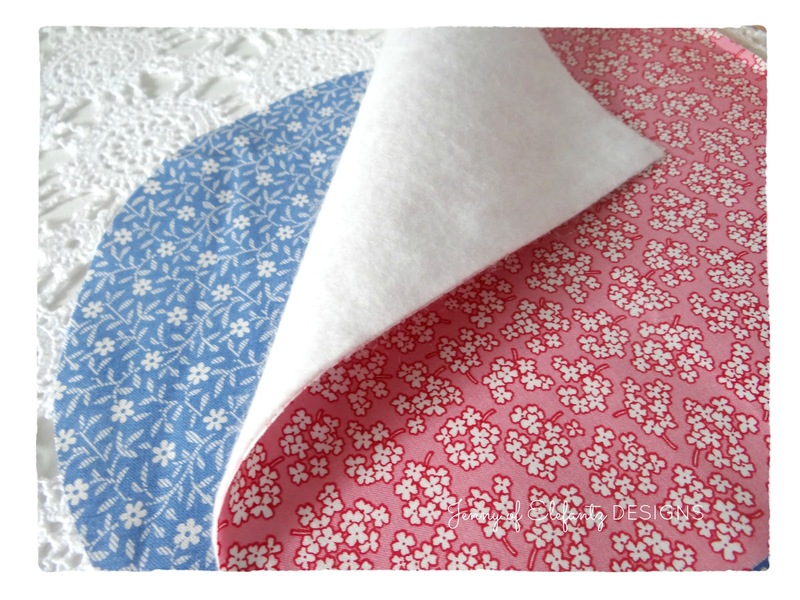 I began by choosing two 1930's reproduction fabrics in pink and blue from my stash, with colours as close as possible to those used in the doily's cross stitch. 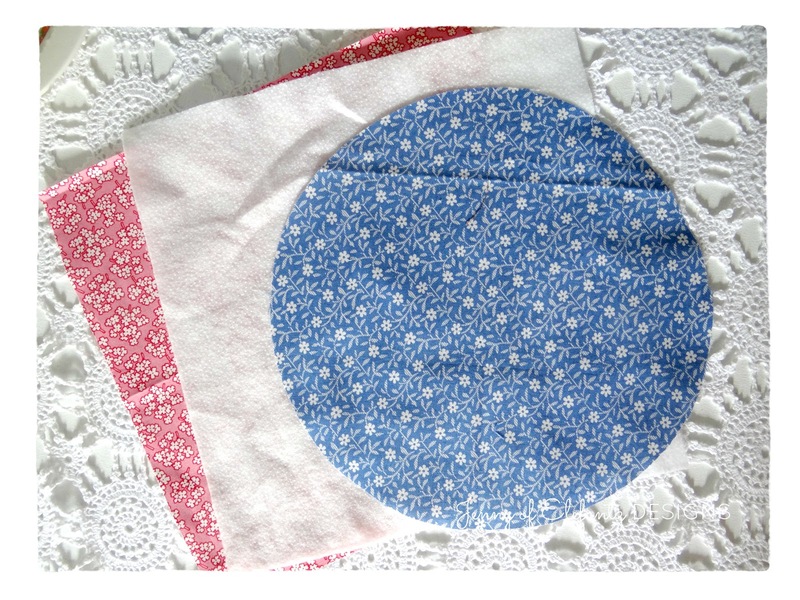 Then I cut a circle from the blue fabric about 1 1/4" wider in diameter than the doily, a square from the pink fabric slightly larger than my circle, and a square of Parlan which I fused behind the pink square. Lay the circle right side down on the pink square and pin the two fabrics together. Sew around the circle with a 1/4" seam, leaving a 2"- 3" opening for turning out. I used blue pins as my markers for where to begin and end the sewing. 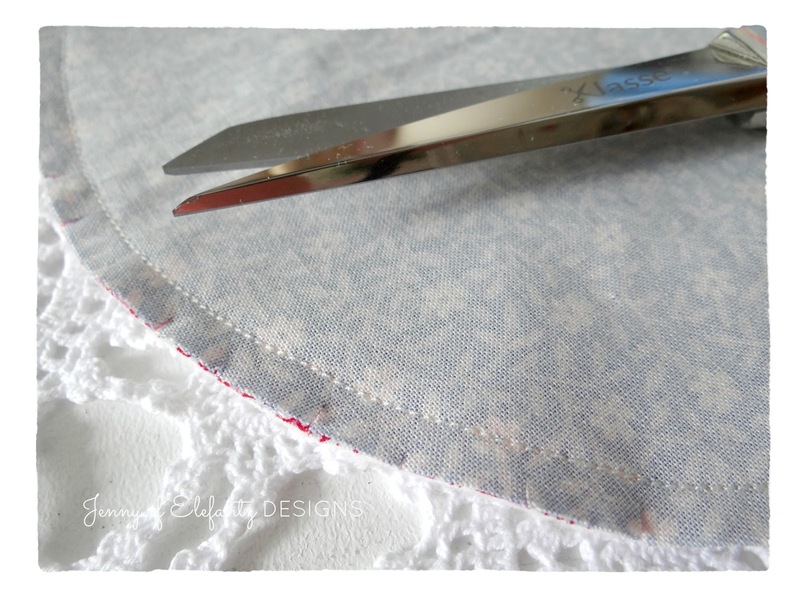 ...and clip into the curve with your scissors, being careful not to cut through the seam line. Turn the circle right side out and press. You now have two sides of the opening to hem. Tack the curved fold of the Parlan backed pink fabric in a contrast colour and iron a curved hem along the edge of the blue fabric. Ladder stitch the two sides together to close the opening and remove the contrast tacking thread. 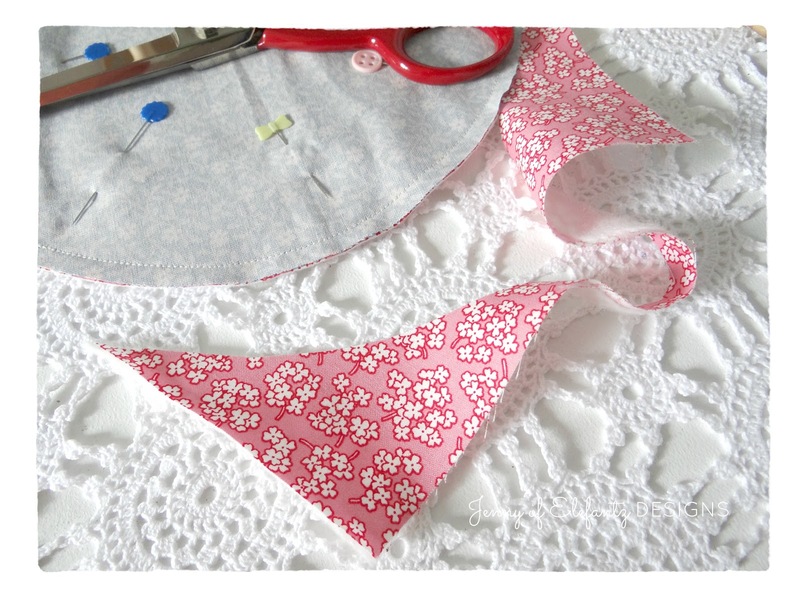 Fuse a strip of applique bonding paper along the centre back of your doily, and once cooled, peel it off. 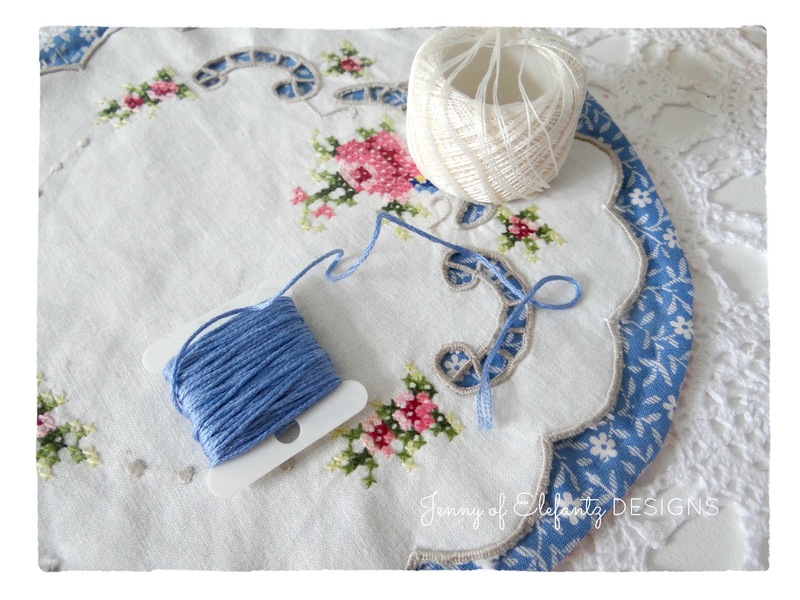 Gentle fuse the doily onto the centre of the blue side of your circle with a warm, dry iron. 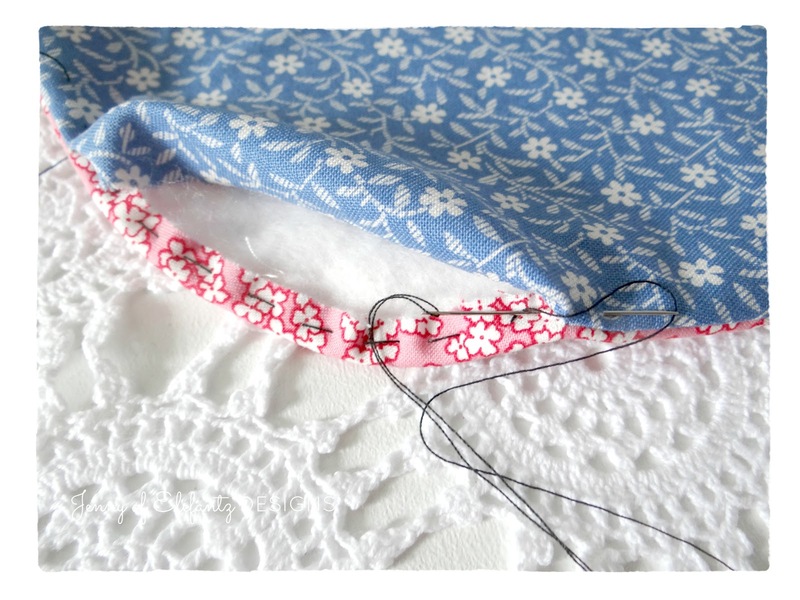 Now you'll need two strands of blue embroidery thread, a length of cream Ric Rac, and some cream Perle #12 thread. Sew a line of blue running stitch 1/4" inside the edge of the blue circle. It's fine for the stitches to show through on the pink side. 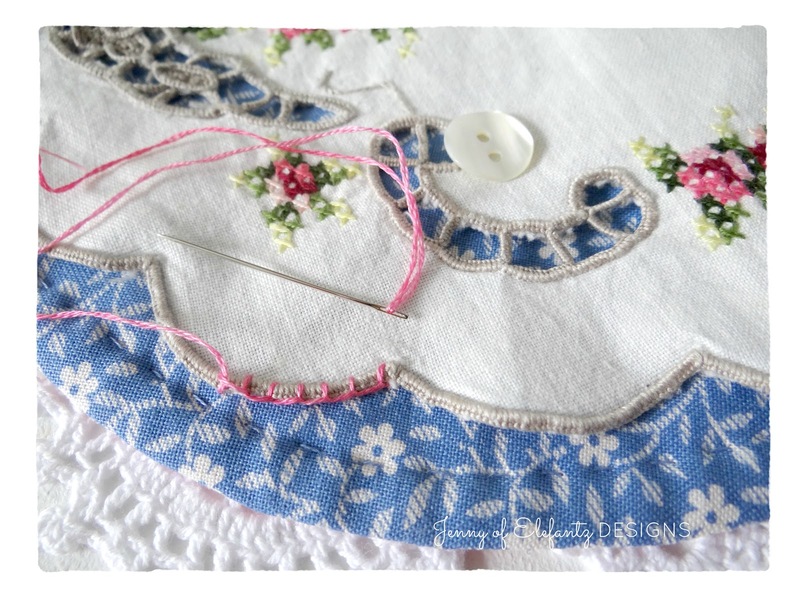 Turn over to the pink side of the circle and use the cream Perle #12 thread to hand sew the Ric Rac over the blue running stitch. 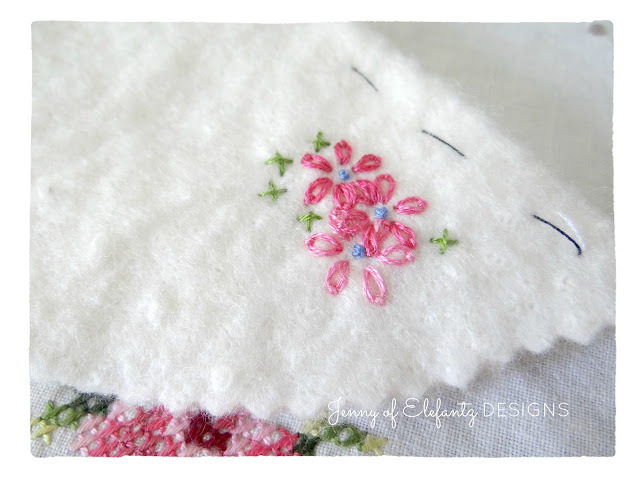 Don't stitch right through the circle, just place your needle between the blue and pink fabrics as you stitch. Use pinking shears to cut a circle of cotton or wool quilt wadding, two inches smaller than your fabric circle. 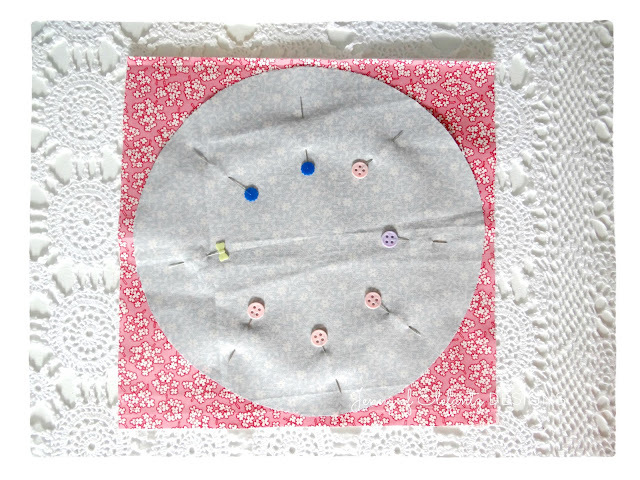 Fold the circle of wadding in half and sew a line of contrast tacking stitch just under the fold as a guide for you when working on the next step. On one side of the fold, embroider some simple flowers with colonial knot centres, lazy daisy petals and cross stitch leaves. 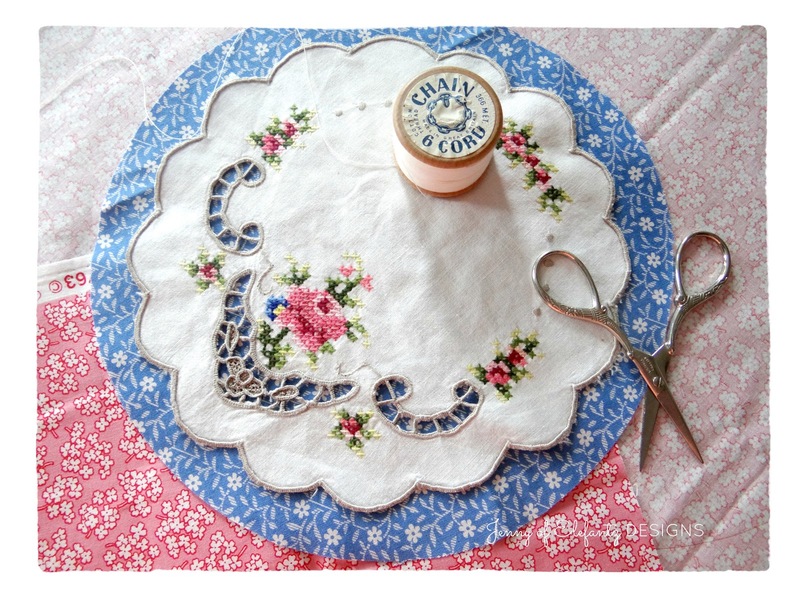 I chose variegated threads very close in colour to the threads used in my vintage doily. You can scatter the flowers around any way you like. I kept the middle of the half circle free because I wanted to add something there later. Take a length of silk ribbon, lay it in position on the pink fabric circle, and carefully embroider a flower into the middle of it, whilst sewing only through the pink fabric and not through the blue. The ribbon is to hold your scissors in place so choose where you want the scissors to be before you start the embroidery. Turn the circle back to the blue side. 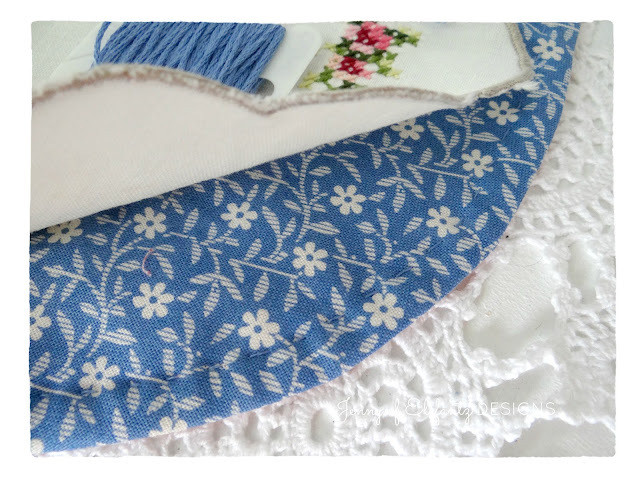 Blanket stitch around the edge of the doily with two strands of blue thread to secure it onto the fabric, being careful not to stitch through to the pink side. 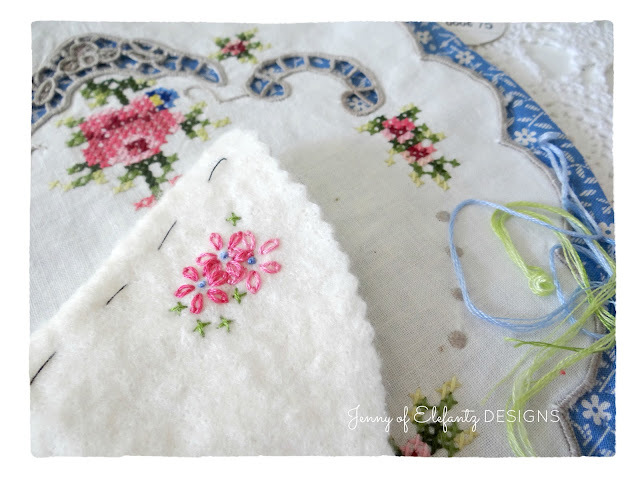 Remove the tacking stitch from the wadding and sew the wadding to the pink side of the needle-book along the centre fold line with cream thread. 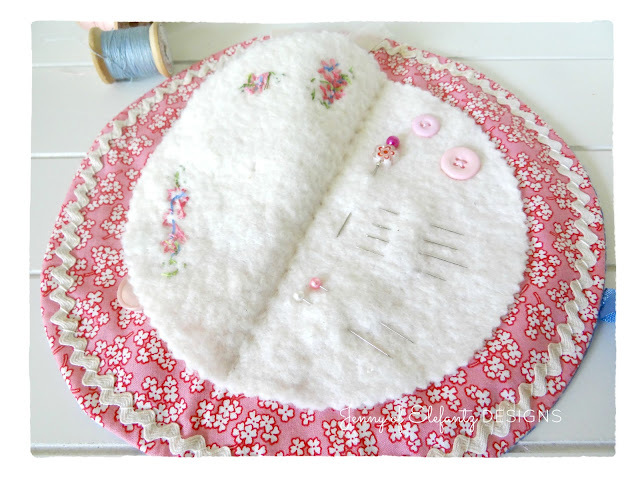 Hide the stitches between the pink and blue sides of the needle-book. From here you can finish the needle book as you like. I sewed a mother of pearl button onto the centre lower front of my needle-book, then folded a length of blue silk ribbon in half and stitched the fold to the opposite edge of the circle. This way when I close the needle-book I can wrap the ribbon around the button and tie a bow for closure. Inside the needle-book I added a few vintage buttons and sewed a sweet round of crochet to the front of the embroidered wadding before adding a mother of pearl button to the centre of the crochet. Lastly I secured my very old embroidery scissors in place with the ribbon. Now you might be fussy about wanting to hide the back of your wadding embroidery? 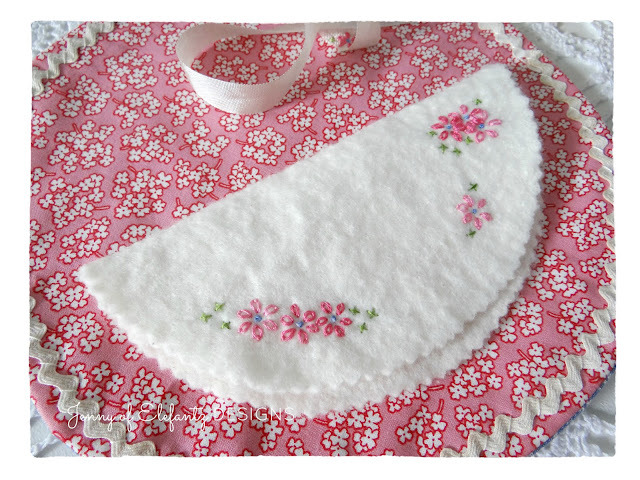 If so, you could add another piece of same sized wadding behind the embroidered one and blanket stitch around the edge of the two wadding circles to secure them together before sewing this piece in place on your needle-book. Truly, this was a delight to make and I hope you have fun making something similar. Have a blessed and joy filled week! 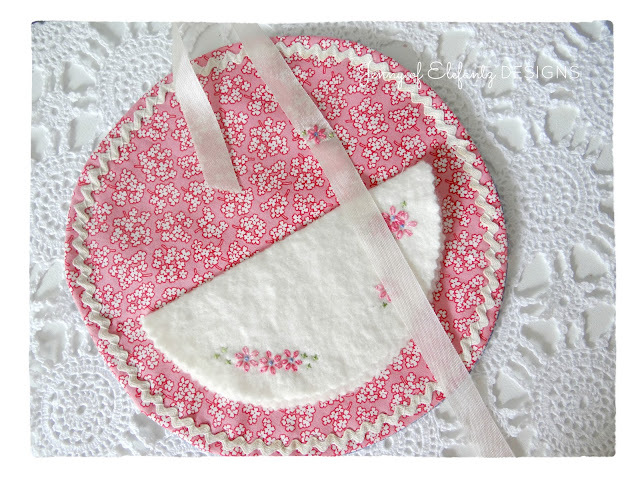 I have a pair vintage doilies very similar to this. I have my Mother's vintage pink jewelry box sitting on one. I love needle books and have a couple waiting to be finished with some wool I found at a garage sale. I have 6 granddaughters and plan on giving each one a needle book from Nana. 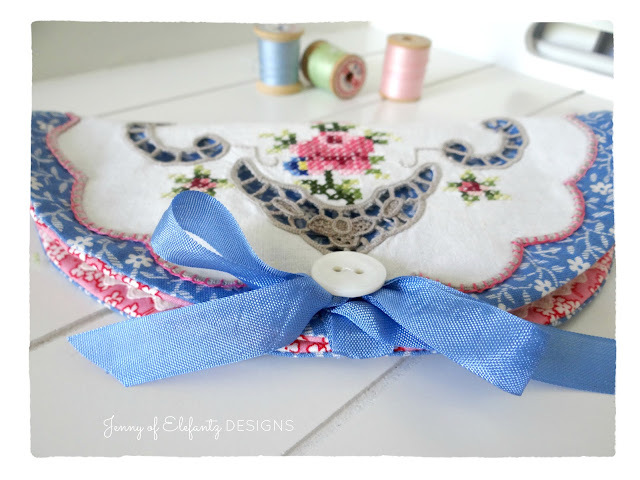 Sew, sew pretty!!! What a wonderful and relatively easy treasure to make to use our vintage materials! I can't wait to make one for my sister who is always after me to make her "something" she can keep. This is the first thing I've ever seen that can use the old treasures and be something she can "use" and keep! Lovely tutorial! 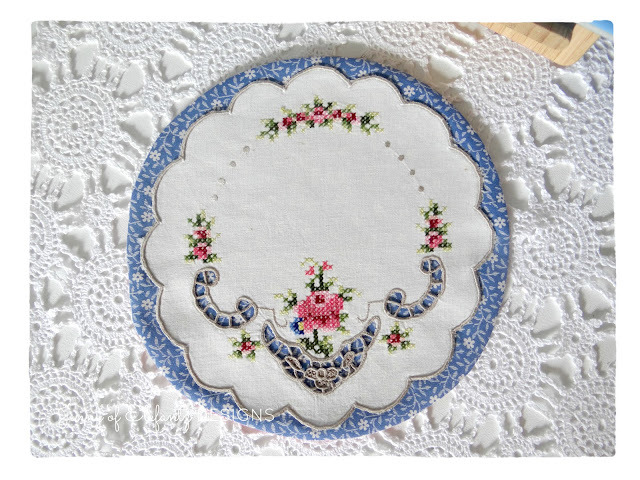 I have an old linen doily that my Dad brought to my Mom from Denmark in the early 1930's. I think I'll liberate it from the cedar chest and make one of these. Thank you so much for sharing! I love this and plan on sharing this link with friends on social media. I adore your creativity. I know one of my friends will make this and will also make a matching one for her 18" American Doll. This is a huge phenomenon here, and perhaps where you live. She's much better at math than I am, I'd never be able to figure out how to reduce it down that far, nor do I have the need. But as someone else mentioned, I do have 3 granddaughters who will find these as Christmas gifts this coming year. One in purple, one pink and one in bright yellows. Be well Jenny and I wish you great luck with your journey into a healthier lifestyle. Jenny, por motivos familiares graves no he podido darte las gracias como debes por tanto como nos regalas casi a diario,por eso aprovecho un momento libre para decirte que te agradezco infinito todas tus entradas en el blog y los preciosos regalos que nos haces..
That turned out to be so beautiful. I always like the way your creative mind works! I will keep looking for a place where I can scrounge until I find a vintage linen that would work for something like this. Knoxville seems to be devoid of such places, but maybe when I'm in Ohio visiting Edi this summer I will find something! This is so beautiful!! Thank you so much for sharing with us!! I just found the perfect vintage linen piece to use for the "home" embroidery -- now I'll be on the lookout for one for a needle-book!! This is so pretty, Jenny. Thank you for sharing it with us. I'm pinning it for future reference, and I'll be on the lookout for vintage linens. Absolutely beautiful, thank you for the tutorial. So beautiful Jenny. Just stunning work. Love how the colour peeps through the holes in the doiley. Just perfection. You seem to come up with the most amazing designs. Your eye for colour is amazing. Thank you. Jenny. How gorgeous is that! 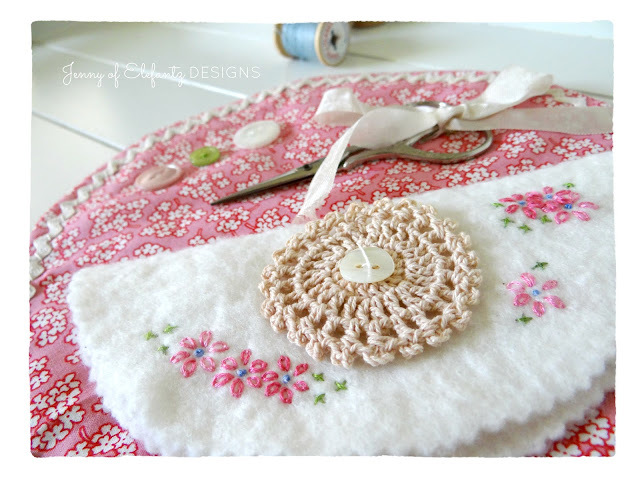 It even looks great as a candle mat before you make it into the needle keep. You have a knack for matching fabrics. 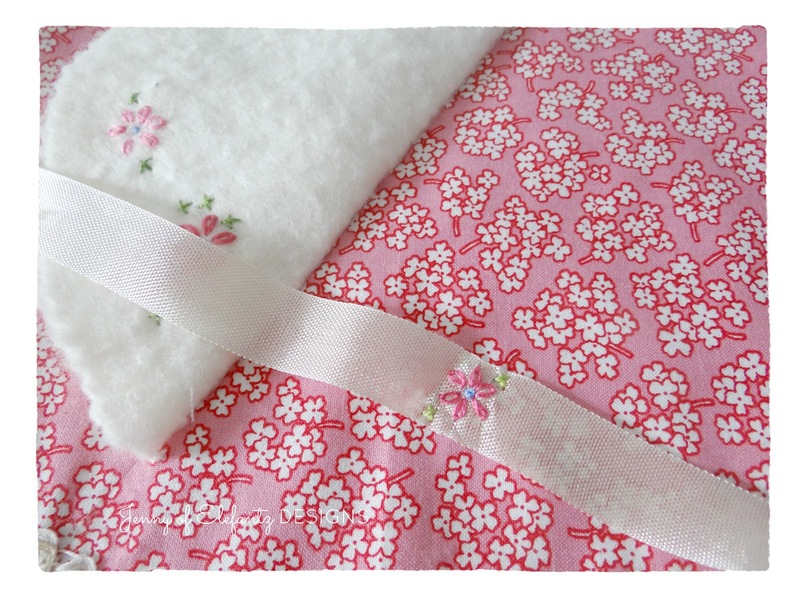 Hmm, a quick project for Mothers Day? This is just beautiful! Thank You. 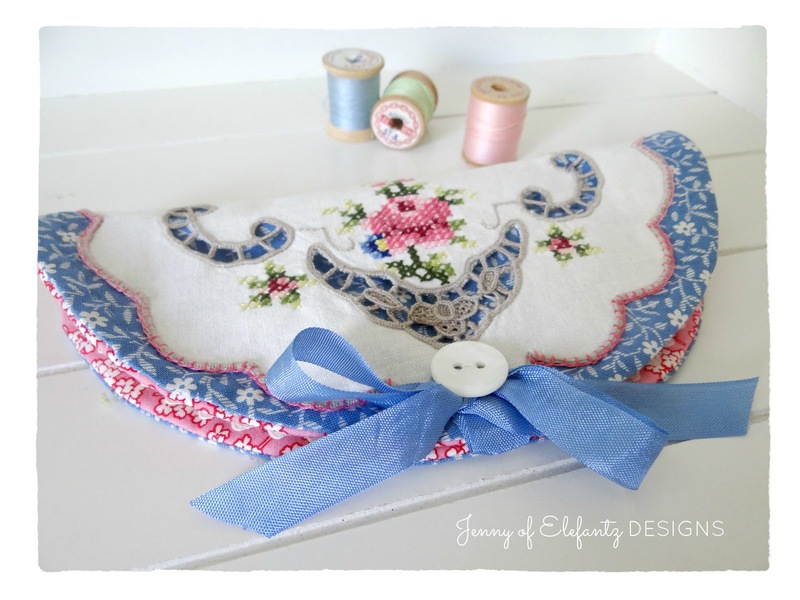 That is such a sweet project, Jenny! I'll need to sort through my vintage linens for just the right doily. Thank you! Just brilliant dear girl - what a stunning keepsake! This is lovely. 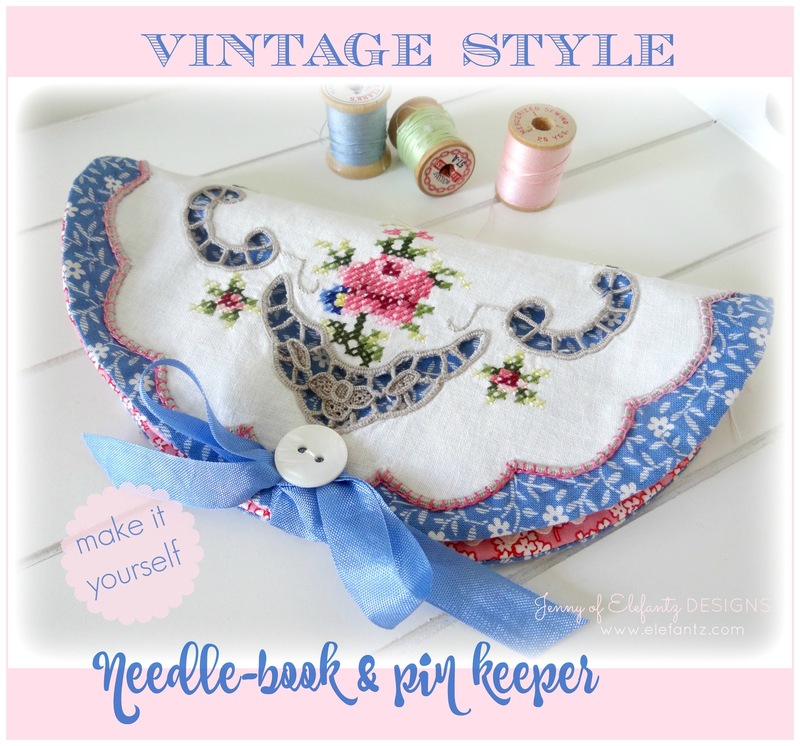 I hope to try this with some of my old linens. I'm like you in that it's hard to let beautiful old linens go to waste. I have a couple of drawers full. Have a wonderful weekend and thank you so much for this idea and the tutorial. Wunder-wunderbar wie alles was du machst liebe Jenny. Vielen Dank, dass du uns immer wieder deine schönen Sachen zeigst. This is very beautiful, Jenny! Way to go! (I guess I should say, "Good on you!") I need to look through my "stuff" to see if I have any appropriate linens. Thank you for the tute. What a beautiful project. Reminds me of things women and young girls made for their hope chests and as gifts. Since am low on ink saved this project in favorites but want to work on making some of these when I finally get my sewing room organized, it's a wreck. Such a small room, hard to work in it to organize, purge. Been wanting to sew but had to get craft room and sewing room done before would let myself do enjoyable projects. Seems to be taking me while longer than I hoped. But when finally do get rooms cleaned up will be worth it, can find what I need when I need it. I love working with doilies, this is 3rd.project in couple weeks have found to make so am looking forward to being able to concentrate on them. Hope your Mother's Day was wonderful. Hello, Really a very nice project! Thank you for sharing it! 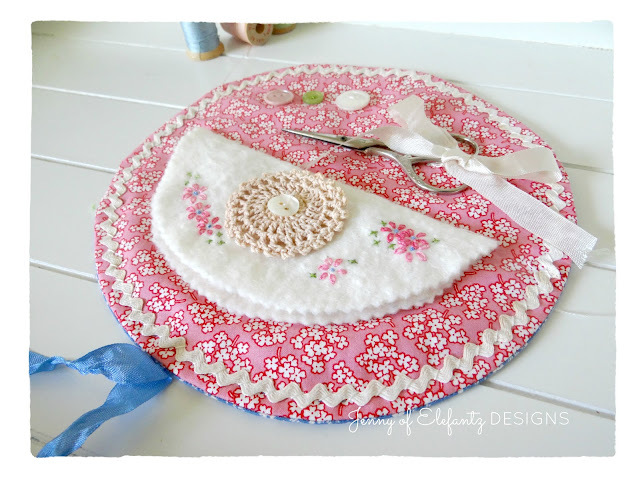 If you don't have a doily, you could always make one! I really love this. Thank you for sharing your creative ideas.